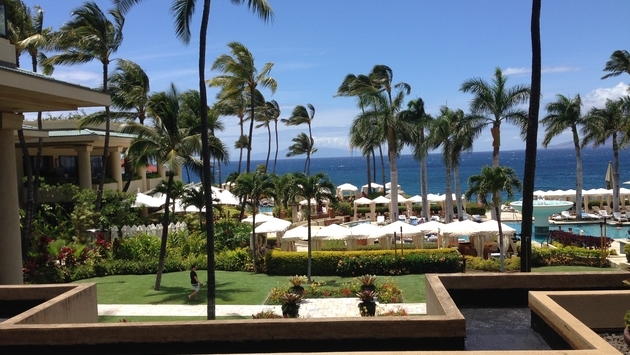 My first impression of Four Seasons Resort Maui at Wailea was being picked up from the airport in a Tesla. Sure, not every guest has the means to use the service through The Limo Company, but it’s just an example of how Four Seasons Maui has been able to distinguish itself over the years. And for those who can’t afford the Tesla service, there is plenty more about the resort to keep you satisfied. During my first day at Four Seasons Maui, I realized that the resort does indeed offer premium luxury, but it’s about more than that. It’s about the service and doing things for guests Four Seasons Maui frankly doesn’t have to do. When you come to Four Seasons Maui, you should expect to spend more money than you usually do, considering it’s Maui’s only resort to earn both the Forbes Five Star Award and the AAA Five Diamond honor. But Four Seasons Maui also offers complimentary services and programs as part of the package, including standard Wi-Fi for unlimited devices, the Outrigger Canoe program, snorkeling, an introductory scuba diving clinic, the use of two tennis courts (plus rackets), daily introductory fitness classes, a golf putting green and the use of cabanas at the main pool and beach. A food amenity is served four times a day at the resort’s three pools, as well. 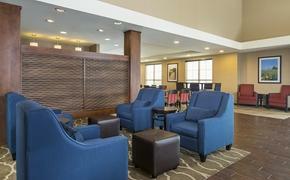 You don’t have to stay in a suite to feel as if you are living in luxury, either. I stayed in one of the resort’s standard Ocean View rooms, a 600-square-foot spread that includes a king bed, a flat screen TV, a sofa and a large marble bathroom with a soaking tub, a separate shower and a couple of sinks to accommodate more than one person at a time. There’s even an in-bathroom dial for music you can crank up, ranging from Hawaiian to R&B to Classic Rock (I turn my Hawaiian music to “11”). Oh yeah, and you can’t beat the view. The center courtyard/garden allows for guests at the rooms to gaze at the expansive ocean, including the surrounding islands. On my first day at Four Seasons Maui, I received a tour of the property from Crissa Hiranaga, the resort’s marketing and public relations manager. As mentioned, Four Seasons Maui has three pools: the main pool (dubbed the Fountain Pool), the adults-only Serenity Pool and the Keiki (Kids’) Pool. The Fountain Pool encompasses more than 3,000 square feet and includes 85,000 gallons of water. The Serenity Pool is 2,650 square feet of pure bliss. The Serenity Pool has received a lot of publicity, and for good reason. It’s technically labeled as an infinity pool (basically, it’s what the edge of the ocean would look like if the world was flat). Included: a swim-up bar, six luxury cabanas and 60 poolside lounge chairs…surrounded by palm trees. I’ve been a poor writer for the better part of 10 years, but getting a chance to lounge at the Serenity Pool made me feel as if it was all worth it. 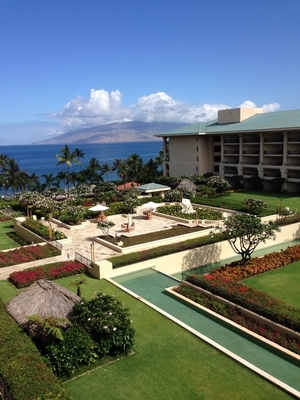 But Four Seasons Maui is not just for adults. It offers an extensive variety of indoor and outdoor activities for kids, including hula lessons, lei making, lizard hunts, ulu maika (Hawaiian lawn bowling), sand castle building, rock climbing, basketball and tennis. During summer, kids can enjoy scavenger hunts, crab hunts and dodgeball during nighttime. Best of all, child care services are available, meaning you can drop your kids off while you go enjoy the Serenity Pool. Four Seasons Maui also has three main shops: Ports (sundries and logo wear shop), Cabana (casual beach fashion wear and accessories) and 22 Knots (women’s high-end fashion, accessories and jewelry). There are also art displays throughout the resort showcasing local artists, from paintings to wooden crafts. On top of that, the resort boasts an acclaimed spa, a 24-hour fitness center, a game room boasting pool and table tennis, and three top-notch restaurants (DUO Steak and Seafood, Ferraro’s Bar e Ristorante and Wolfgang Puck’s Spago). Of course, it helps to be situated on beautiful Wailea Beach, too. On my first day at Four Seasons Maui, I received the oceanside 50-minute Lomi Mohala massage, one of the spa’s four signature treatments. After I lounged in the waiting area (complete with dried fruit, coconut and delicious ginger-infused water), I was taken to one of the resort’s three oceanside hales (or thatched huts). From there, my massage therapist, Christine, used several products designed to ease tension and relieve muscles and joints, including ISUN’s Mohala oil, doTERRA’s Deep Blue oil rub and Warren Botanicals’ muscle and joint relief (from the Big Island). And the view from the hale is no joke. While standing up, you receive a view of the beach area and ocean directly in front of you. While sitting or lying down, all you see from the front of the hut is deep blue ocean. Before I entered dreamland, I talked to Christine, who has been working at Four Seasons Maui for the grand majority of the resort’s existence, which spans back to 1991. She said what she enjoyed most about being a massage therapist was the fact that she was helping people, which is in line with Four Seasons Maui’s commitment to guest service. Christine said you have to genuinely care about people or you won't last very long as an employee at the resort. And, indeed, I could tell Christine genuinely cared. Beyond the conversation, I was eternally grateful for the massage, which made me feel as if I was floating back to my room. I also bought the ISUN and Warren Botanicals products Christine used at the spa’s gift shop. From there, it was on to DUO Steak and Seafood. 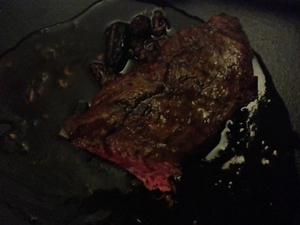 DUO Steak and Seafood has won numerous awards. Most recently, it was awarded Wailea’s “Best Steak” in the 2014 ‘Aipono Awards, chosen by readers of Maui No Ka ‘Oi magazine. While dining there, I tried out the crab cake appetizer with avocado and the Washimi-Hawaiian Origin American Kobe Style Flat Iron steak (a blend of beef from Hawaii and America) with Hamakua mushroom bordelaise and a side of buttermilk mashed potatoes. I also sipped on the “Type O” cocktail (made with Bombay gin, blood orange puree, yuzu citrus fruit and dill) and a Manhattan (hey, I have to review the restaurant’s variety of selections, right?). It all was great. The appetizers and mashed potatoes melt in your mouth, and the steak is enhanced by the DUO’s delicious signature sauces. I was also greeted by several different staff members during my dinner, including one of the chefs and general manager Jimmy Watt. I noticed Watt interacting with one of the kids at the restaurant while I dined. One more thing: The sunsets at Four Seasons Maui aren't bad, either. Stay tuned for Days 2, 3 and 4 at Four Seasons Maui.